This post is sponsored by Carlson™ Pet Products. I am being compensated to help share the Carlson Portable Dog Cot, but we only share information we feel is relevant to our readers. Carlson™ Pet Products is not responsible for the content of this article. It’s been several years since I raised my last puppy with Guide Dogs of America, but I still attend monthly meetings and help out at puppy kindergarten and obedience classes. A few months ago I was working with our area leader teaching the dogs “place” using a Carlson Elevated Portable Dog Cot. The Carlson Portable Dog Cot was the perfect tool to teach “place”. Not only that, but I could think of hundreds (not literally…maybe a dozen) of other uses for an elevated portable dog cot. Guess what? 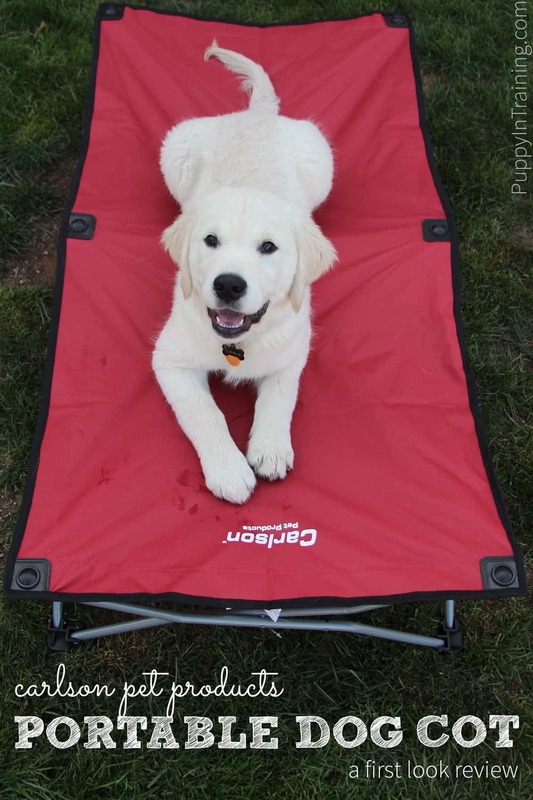 I recently got my hands on a large red Carlson Portable Dog Cot for review. Portable Dog Cot – Collapsed. It gets very compact. 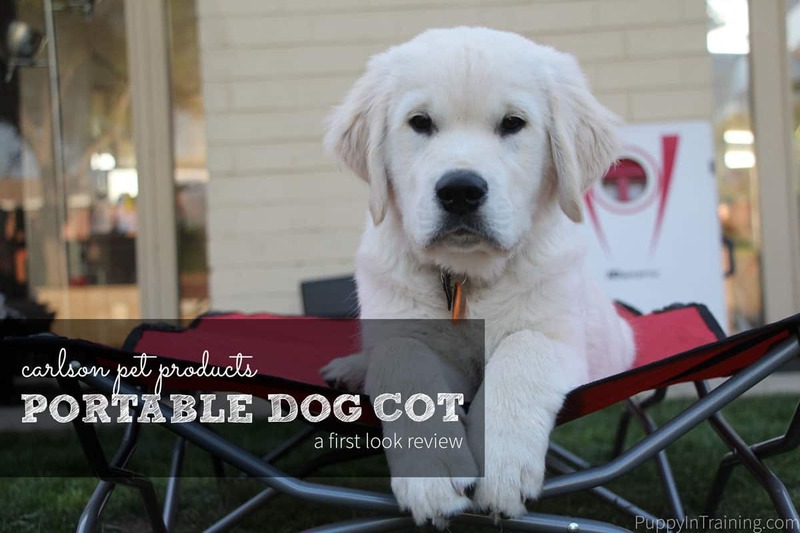 I’m not going to bore you with all the details and descriptions so lets hop on over to our review of this portable dog cot. I was excited to get our hands on our very own Carlson Portable Dog Cot. As you can see Raven enjoys relaxing poolside on her new dog cot. Linus: Hopped up, layed down, jumped off. Raven: She got on the cot and curled up and only used half of the bed. Raven is a 70 pound Golden Retriever and she decided to only use half of the bed! Initial reaction from the dogs: THUMBS UP! Everything arrived on time and I like the packaging Carlson uses for both the Portable Dog Cot and the Portable Pet Pen. Very, very easy to setup. Pull out of box. Remove cover. Fold down. Setup in seconds! Canvas feels very sturdy and frame is made of steel. From Carlson: Designed to handle up to 95 lbs. Lightweight and even before removing it from the box I could tell it would be very easy to transport for visits to the park, beach, and adventures camping. Initial reaction from the human: THUMBS UP! While I’ve only had it for a couple weeks it feels very durable. Easy to clean – I’m considering moving my dogs to these elevated beds because they are so much easier to clean compared to their regular dog beds. Perfect size for our dogs. I have a 55 lb Aussie Mix, a 70 lb Golden Retriever, and a 80 lb Labrador Retriever. We are not regular adventure dogs. Most of our outings are for the benefit of socializing one of our service dogs. Camping, Fishing, Hiking, Backpacking – The last time we went backpacking was at the Narrows in Utah a couple years ago and Linus hasn’t camped with us in…I can’t remember. While we’re not regular outdoorsmen we do make the occasional excursion with our dogs. Dog Beach – The service dog organizations don’t allow our pups to go to dog parks including dog beach. Once again we are not regulars, but we do partake in outings to dog beach from time to time. Parks – We do have a regular outing to the park with our guide dog group and this would be a perfect time to use our portable dog cot. Pickleball Tournaments – My parents purchased a motorhome to travel to pickleball tournaments. Yep, this would be a good time to bring your dog cot. Home Indoors and Outdoors – I currently have mine setup in my office. I also bring it outside when I’m doing yard work. It’s portability makes it easy to move from one place to another. 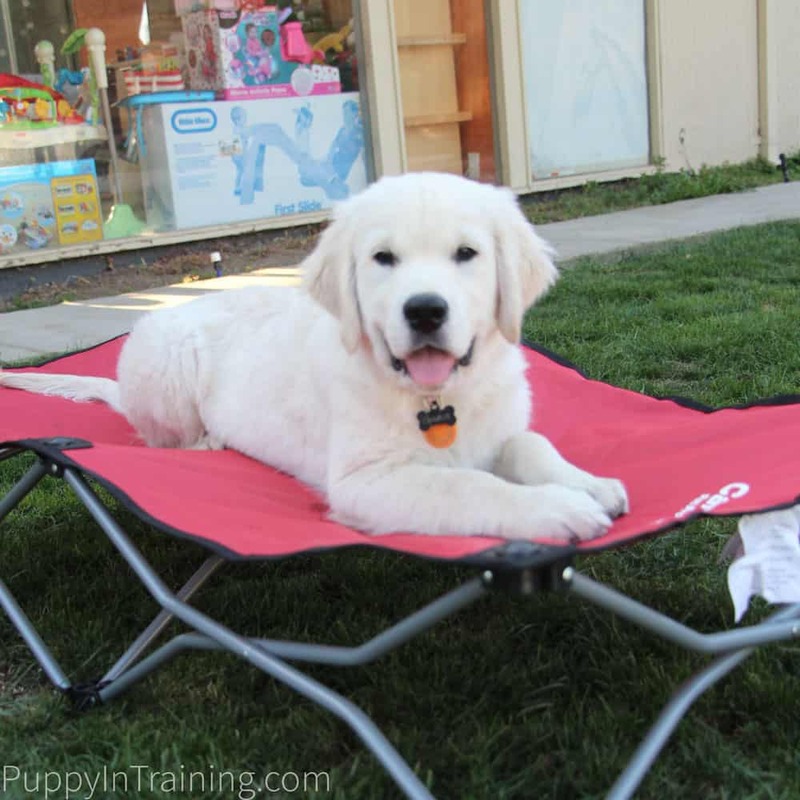 Training – As I mentioned in the introduction the portable dog cot is a great tool for teaching cues like “place” or “go to your bed”. Other Outings – I’m not involved in events like Agility, Nosework, Rally, etc., but I imagine there would be a use for a Carlson Portable Dog Cot between runs. What else? Can you think of anything to add to this list? How would you use a Carlson Portable Dog Cot? I wish the canvas was removable for replacement – It’s the first thing I envision will wear out. I haven’t seen my dogs do it yet, but I often see them digging into their beds before they settle in. I wish the feet had a no-slip pad – I have a bunch of spare no-slip stickers I had for my furniture that I added to my dog cot, but I wish they came standard with this product. One thing I always do before purchasing a new product is check out the user reviews on Amazon.com. How easy it is to clean. There were two main groupings of negative reviews. The “large” dog cot needed to be larger. My thoughts: The dimension are clearly listed: 48” L x 26” W x 9” H. This size is fine for my dogs between 55 lbs and 80 lbs. My thoughts: This is something I’ll have to report back on in a future update. The good news: several Amazon users found DIY fixes for this issue. Over the next few months the one thing I’m going to keep an eye on is the durability of our dog cot especially the rivets. I’ll report back with any updates. We’ve had and used the Carlson Portable Pet Pen now for a year and a half and love the product! 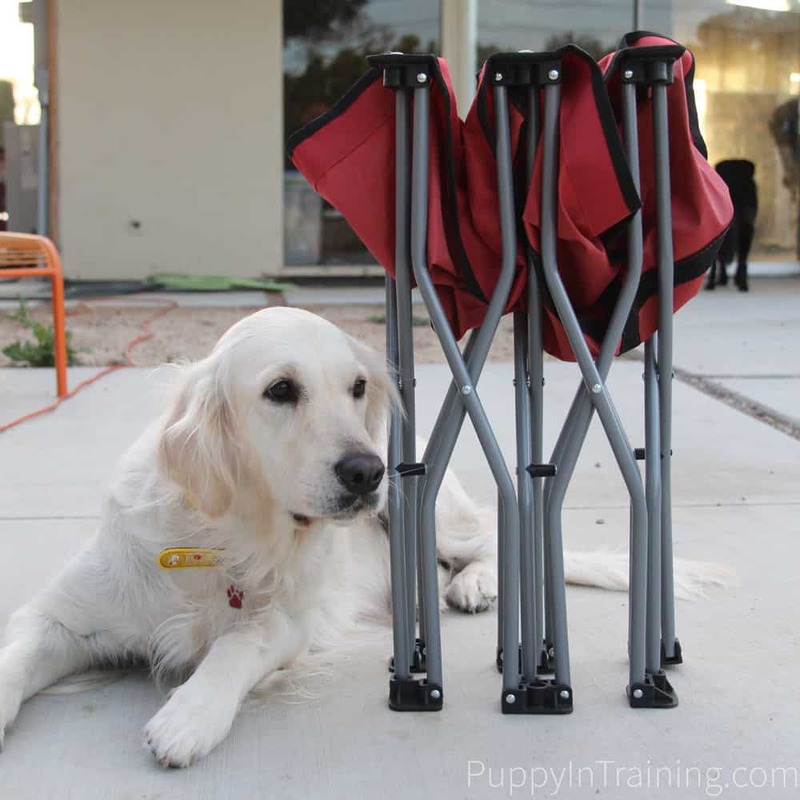 It’s been durable and has lasted through two litters of puppies. That’s 14 puppies in total! We’ve come to trust the Carlson brand and even though this is a sponsored review we think highly of the products we’ve tested and reviewed. After two weeks of use we’ve seen the same high quality int the Carlson Portable Dog Cot and while we wouldn’t mind seeing a few minor additions it’s definitely a product we’d recommend for the outdoor adventure dogs or even if your just looking for an elevated dog bed to use at home. 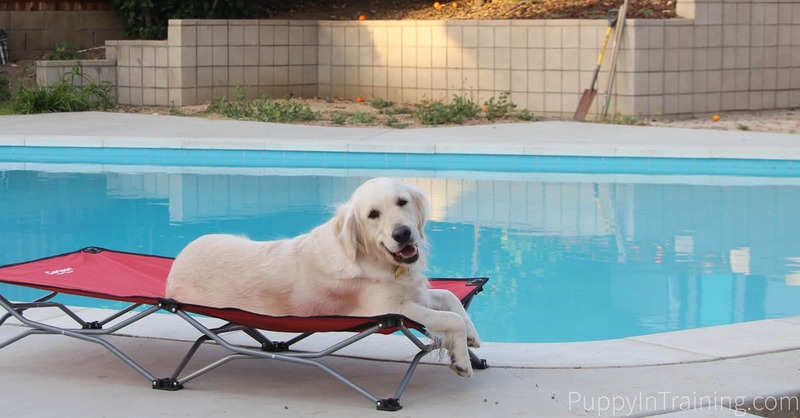 Have you ever used an elevated portable dog cot? Thanks for stopping by! We’re enjoying our Carlson Portable Dog Cot. If you’re looking for something that’s highly portable and elevated this might be the dog bed for you. We keep a green Carlson cot set up almost all the time on our apartment balcony. It hasn’t faded even though it’s been outside for months. My senior Lab mix Ace will use it on occasion but he is a little nervous that he will slip on it. Remy the 60-pound weim naps on it most afternoons in the sun for an hour or so. It is the perfect size for him. Thank you so much for writing this review. I like how you are using the Carlson cot for “place”. At mealtimes we use “place” to get my dachshund to sit nice before he eats dinner. The portability of this bed is an added bonus! We can make my dog have good manners on the go. All of our dogs have to sit and wait for their food too (the old timers aren’t too good at it anymore, but that’s more a reflection on us then them). I always notice that meal time is a good time to work on training. It seems like puppies will do anything for breakfast, lunch, or dinner. My dog Maffy would love this, especially as he’s so old! Great article, thanks! My only concern for an older dog is sometimes their balance is not as good and they may not like the elevated feeling of this bed versus a standard plush dog bed. Your review of the Carlson Portable Dog Cot was very informative. I will tell my son about it for his German Shepard Brooklyn. She is outside during the day and the cot would be ideal for her. I also like that it’s easy to clean as she gets into the dirt. One of the things I like about these cots vs a regular dog bed is there’s no inner stuffing. Since we raise puppies we almost always end up with a piddle or two on our doggy beds. When it gets into the stuffing it’s pretty much there to stay. I was really amazed of how does it work! Great article!